Seeing as we still had the double-banger finale of Dawson’s Creek to watch last night while I’d reached the happy dance part of my stitching, I ran into my room and grabbed a kitted up ornie that was within arm’s reach, so I made a small start into this one as well. 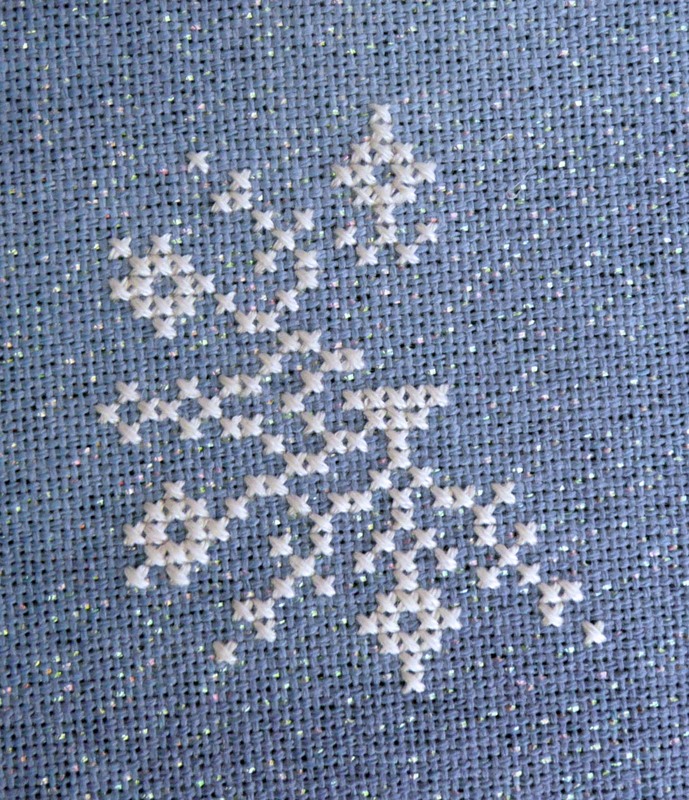 This is being stitched on a hand-dyed sparkly Lugana I got in a grab-bag from somewhere (had to be either Silkweaver or Countrystitch). I may be anti-social in my bedroom today and catch up on a bit of ‘Anne TV’ (ie that Katie doesn’t watch), and get this one finished. Then I need to finish off my scissor pocket exchange ready for posting this week. I need to remember to try and take some decent photos of Lizzie*Kate’s Boo Club this weekend so I can roll it away until I turn it into a quilted wallhanging. I don’t have any fabric that’s suitable (Halloween fabric over here is pretty impossible to find in good prints), so that might take a while. I may end up just giving in and using some complementary plain fabrics, but there’s no hurry for this one to be finished for a while yet. The rest of the weekend will be spent taking Katie shopping to buy a TV and TiVo for her room, and just generally being lazy. Work is so exhausting during the week I almost need boring mindless weekends to keep my sanity in check! 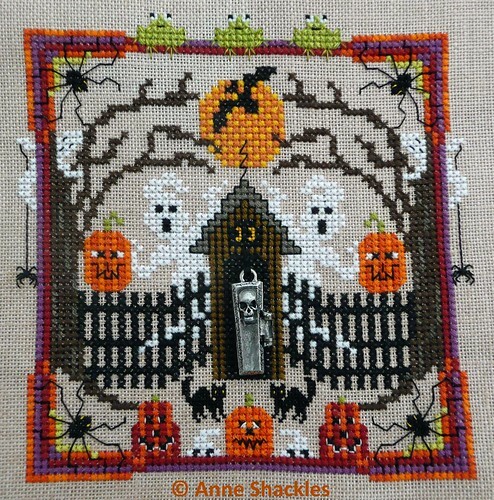 Anne S • This entry was posted in Finishes, Halloween, Just Nan, Works in Progress. Bookmark the permalink. Cute finish! I love the frogs at the top and the charm is very cool 🙂 I like your ornament too, that’s a pretty blue fabric. Love it! Congrats on another great finish! Congratulations Ann. He is such a gorgeous finish and how fun to check something else off the list! Love the fabric for your ornie. That is so cute! I just bought JN’s Counting Bats, I hope it turns out just as well. Lovely finish as always, Anne, and yeah, that charm sure is cute! 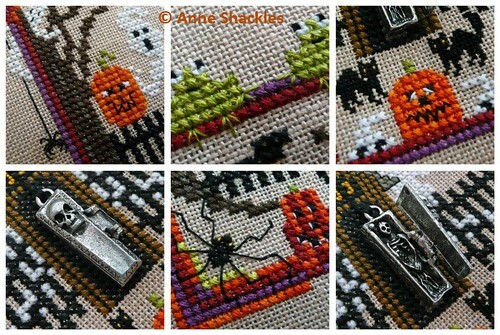 Have you tried eBay for Halloween fabrics? I got some great stuff a couple of years ago when I was looking for some for a project. A lot of patchwork suppliers seem to sell via eBay, and I bought a lot of fabric from them. Congratulations!!! It’s one of the coolest of JN’s Halloween charts imho, you’ve stitched it beautifully. Oh it is wonderful I like I find this magnificent embroidery! That is adorable! I love the casket charm! I love relaxing weekends, I’m lucky to have found a man who does too, for the most part we just hang out around the house on weekends, while it seems the rest of the world parties it up. GTG looks fabulous, I love the colors. Love this finish, the coffin charm is great.